Allelic dropouts (ADO) are an important source of genotyping error and because of their negative impact on non-invasive sampling techniques, have become the focus of considerable attention. Previous studies have noted that ADO rates are greater with increasing allele size and in tetranucleotides. It has also been suggested, but not tested, that ADO rates may be higher in studies using cross-species microsatellites and that mutations may play a role in ADO rates. Here we examine the relationship between ADO rates and the relationship between evolutionary distance since divergence time between species for which the microsatellite was designed for and species on which it was used (divergence times), and how this may interact with median allele size. In addition, as the adenosine (A) and thymine (T) content of the primer may increase mutation rates, we also included total % AT content of the primer in the analyses. Finally, we examined whether other commonly associated causes of ADO (i.e. repeat motif length, median allele size and allele number) co-varied. We found that ADO rates were positively associated to divergence time and median allele size. Repeat motif length, median allele size and allele number positively covaried suggesting a link between mutability and these parameters. Results from previous studies that did not correct for co-variation among these parameters may have been confounded. AT content of the primer was positively associated with ADO rates. The best linear regression model contained divergence time, median allele size and total % AT content, explaining 21% of the variation in ADO rates. The available evidence suggests that mutations partly cause ADO and that studies using cross-species microsatellites may be at higher risk of ADO. 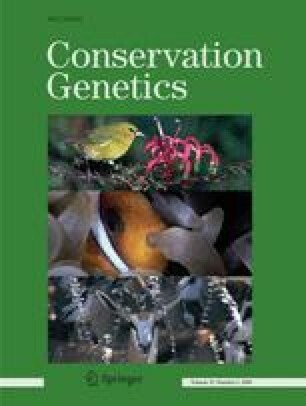 Based on our results we highlight some important considerations in the selection of microsatellites for all conservation genetic studies. We are grateful to Biotechnology and Biological Sciences Research Council (KJE) for funding and the editor and referee for their comments.